The Barras Yet or Burgh Gate in the Port Street / Dumbarton Road area was the main entry into Stirling for at least 300 years. Demolished in the 1770s, it was the place where customs were collected and criminals were formally drummed out of the town. There are frequent references to its repair in the records, and in 1617, it was renovated for the visit of King James VI. It was here that the burgh of Stirling surrendered to the Jacobites in 1746. With the Bridge, Castle and Tolbooth, it must have been one of the distinctive features of Stirling, but there are no contemporary illustrations. 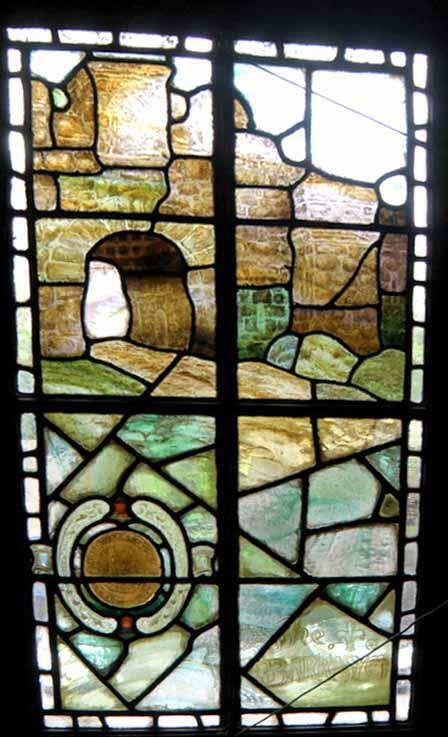 This fine panel of stained glass was made 100 years ago, and is one of the historical jewels which adorn the municipal buildings, designed by architect John Gaff Gillespie in 1908, but not completed until 1918 and the end of the Great War. The architectural detailing in Municipal Buildings is an expression of pride in Stirling’s history and heritage. William Wallace, the burgh charters, Mary Queen of Scots, John Knox, Robert Burns, the Scottish Regiments and much more is celebrated in sculpture, murals, plasterwork, stained glass and carved wood. The building is a fine container for its new future as a digital powerhouse.